As with previous sets Richard Garfield worked on, I really want to know the internal dynamics of Dominaria, especially as they relate to his contributions. He worked on Tempest, Urza’s Saga, Odyssey, Judgment (we all have bad days), Ravnica, Innistrad, and Dominaria. Do they bring Garfield on when they really, really need a hit set, and he delivers? Or do they bring him on when they already have something great in the works? Is he really that brilliant of a designer, or does his mere presence inspire other designers to work longer hours to really deliver their best work? Judging from the stories about the mechanics he’s actually designed, I’m on the side that Garfield really still is a great designer (at least as far as Magic; I played King of Tokyo and found it really dull). His playtest Sagas are beautiful, innovative, and led to one of the coolest mechanics Magic has had in years. But let’s zoom out. Dominaria doesn’t just have a great mechanic. Dominaria is a great set. It is one of the great sets in Magic’s history. If Innistrad is Magic’s “Blood on the Tracks,” then Dominaria is Magic’s… whichever one of Dylan’s later albums my readers really like, I haven’t dug nearly deep enough into his discography to leave this analogy without embarrassing myself. I’m so sorry. 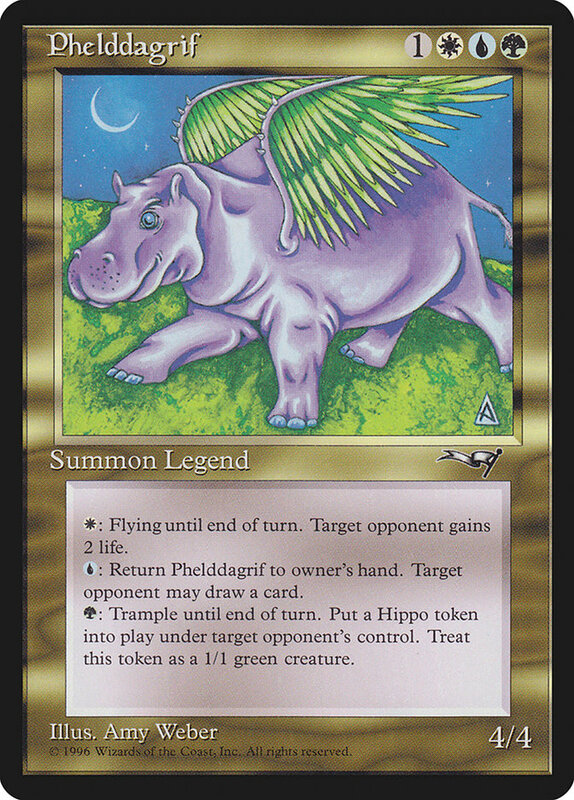 The set has two obvious precedents: Time Spiral, for its nostalgic setting, and Kamigawa, for its legendary theme. Wizards and I, of course, disagree on the merits of those past sets, but it’s encouraging to see them trying things that are so, so close to those blocks without rejecting them based on their ~marketing research~ or whatever. Dominaria doesn’t have the same adventurousness than defined Time Spiral, and it’s nothing like Future Sight, but it executes it better than any set in Time Spiral or Kamigawa blocks. And unless you’re a dork like me with a blog about Magic design, you’re probably gonna spend more time actually playing with these sets than just thinking about them in the abstract, and the execution is really what matters there. One trick that Wizards has had success with is uncommon signposts. That is: powerful gold uncommons that you open that basically yell at you, “hey, draft this archetype, dumbass.” Some of them are fairly straightforward in telling you what to do with them (draft Adeliz, then a bunch of wizards; draft Hallar, then a bunch of kicker spells), while others (especially Tatyova) are fairly open-ended. But in Dominaria, it doersn't stop at the gold signposts: it has perhaps the most interesting suite of uncommons ever put in a set. 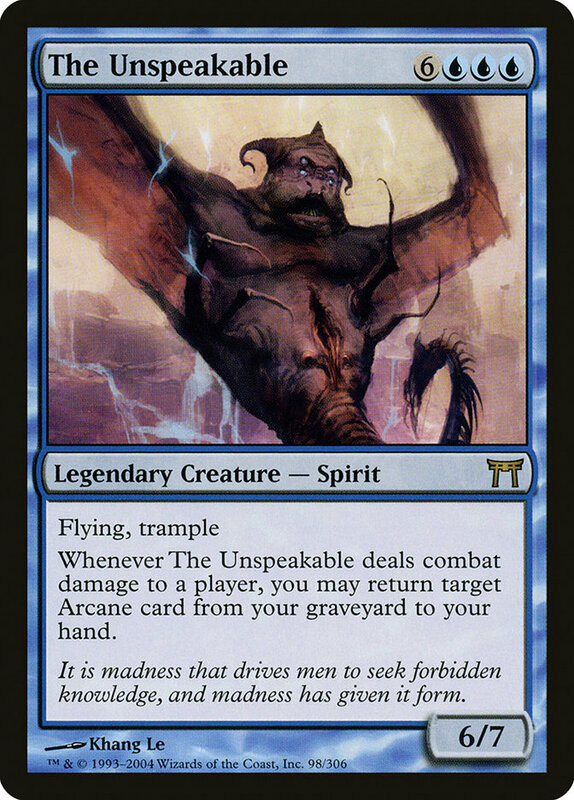 On my favorite Magic forum of GoodGamery, user Bracketbot put it nicely when he called The Eldest Reborn “the most mythic feeling uncommon ever.” It’s not just that they slapped a legendary supertype on it as a hashtag mechanic to support the set’s themes, they actually put in the work of making the uncommons feel legendary. (Or historic, in the case of the sagas.) 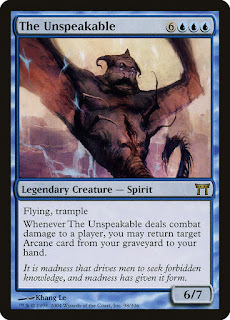 Cards like Tetsuko Umezawa and Song of Freyalise aren’t just too complex to be uncommons from back in the conservative era, they’re too interesting to have been uncommons then. They’re cards you can really plan a game or an entire deck around, in both constructed and limited. Sagas share something with Planeswalkers: they’re the first cards since Alpha that just look dramatically different than normal cards. (Of course, them sharing a lot of things in common with Planeswalkers isn’t coincidence, since the design was a modification of an early iteration on that card type.) They were a card that, when the set was leaked early, even with the full spoiler, we didn’t know exactly how they would work. If Magic is to continue going forward, if it’s to continue surprising us (at least occasionally), Magic really needs these kinds of cards: something so dramatically different that they don’t even look, at first glance, like something that’s possible in Magic. That unique graphic design goes hand-in-hand with some truly excellent art on them across the board. They’re united by the theme of what the art from that culture would look like that portrays their own history, which gives space for individual artists to go outside of what fantasy art is “supposed” to look like. It’s kind of meta-fantasy art: in a fantasy world, what would art about their own legends look like? 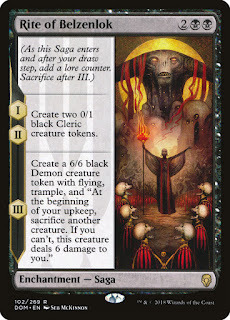 While sagas have the artwork that pops the most obviously, the art on the set is overall very good; the game feels like it’s finally pulled out of the doldrums it’s mostly been in for many years and has some artists with some uniqueness, artists who can paint something other than “what would this spell look like if it was literally a real thing.” Both Palumbos are worth special attention as excellent artists newer to the game. The art is definitely not as weird and impressionist overall as, say, Mirage (still the best period for art in the game’s history, sorry Mike), but it feels like it’s actively encouraging artists like Seb McKinnon to have individually recognizable styles. 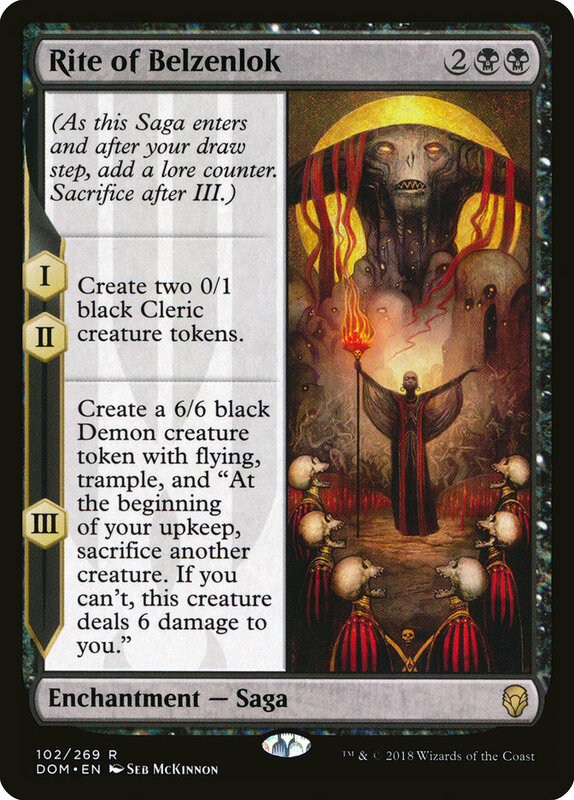 Seb only got one piece in Dominaria, and I’m supposed to be writing this review about Dominaria, but… I just really like Seb McKinnon. Dominaria has an important non-saga mechanic, of course: historic, its replacement for Kamigawa’s focus on legends. The cards in Dominaria that are necessary rather than exceptional by themselves are enablers for historic (mostly low-mana cost common artifacts). Basically, these fill the gaps when one basically wants to draft around legends, but there wouldn’t be enough legends to really be able to make that happen, so you throw some artifacts in and the deck works better. It’s basically a limited-only distinction between “legend matters” and “historic matters,” and I can’t remember any time that the “historic” designation has come up in my recent games of Standard. (Maybe that’s because mono-red, the deck I play against half the time, doesn’t build around anything other than making a life total equal zero.) I respect that historic was necessary for Dominaria to work in its emphasis of legends, but I think Rosewater exaggerates its importance; a lot of those cards that seem like the backbone of the mechanic aren’t even played often in draft. Players aren’t tripping over themselves to draft enough Powerstone Shard to make their decks function in the way that Lorwyn drafters consistently moved their ratings of Changelings (the gold standard of a limited backbone mechanic) higher and higher. Dominaria doesn’t just call back to earlier Magic with lore references, but by using its individual card designs to recall an era when the end result was just making one cool card. You were supposed to pick up a card at random and go, “whoa!” and want to do something with it. When sets started to have grander ambitions, more and more of a set had to be devoted just to providing the backbone for the rest of the set to flesh out. Instead of maximizing the coolness of every card, they had to do necessary-but-boring things like changing colors in Invasion, or providing a way to discard cards in Odyssey, or finding a way to bridge multiple creature types in Lorwyn (or Onslaught, a little bit). 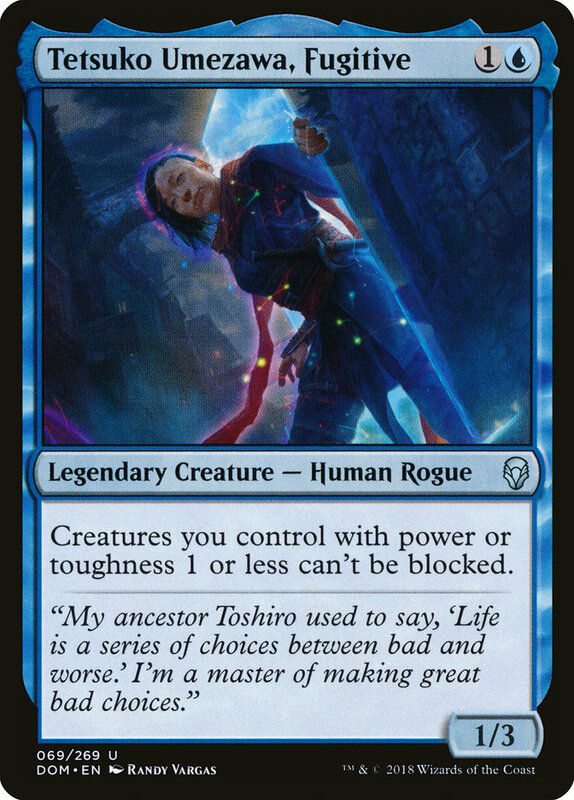 Dominaria doesn’t try to avoid this entirely, of course, but cards like the sagas aren’t just trying to make the set function on a basic level. They’re trying to excite the player and think about the best possible thing they can do. Dominaria really impresses me with how it’s able to accomplish these dual goals of making individually amazing cards while keeping a set structure intact. Cards like Whisper, Blood Liturgist do a perfect balancing act of both being amazing to read individually while also playing into the set’s limited archetypes (mostly fungus-related, in Whisper’s case; also, Whisper is such a badass name for a legend, nicely done, flavor team). Something I missed for a long time in Magic were the one-off cards that got the deckbuilding gears in my mind turning. Are there enough good Auras/Equipment and enablers to make a deck with Danitha Capashen and/or Valduk work? Is a mono-blue deck with Naban better than one without? (No.) In sets past, it felt like the deckbuilding was either on rails in building around The Mechanics You Are Supposed to Build Around, or you’re just supposed to throw all the individually-powerful cards together. 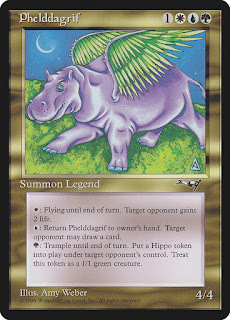 All the cards that did unique, interesting things were purposefully priced out of ever being in a competitive deck. Kaladesh really fucked up in this respect, but god bless it for at least making weird-looking cards where you read it and go “hey, maybe that’s broken,” and there’s a chance it actually was. Dominaria doesn’t make the mistake of pushing the unknown too far in power level, but instead, it at least makes it look like unexplored territory might hold something valuable. It actually contained the text “exchange your life total with [cardname]’s power! And it wasn’t even a mythic! Dominaria, to me, isn’t just a good set. It’s a set that finally, really, definitely puts the nail in the coffin of the conservative era of Magic that I mentioned earlier. 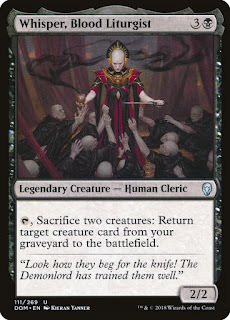 I was fairly certain when seeing Kaladesh that era in Magic was dead, but when the bannings started to hit, I was nervous because the failures of Kaladesh could have triggered an internal backlash just like Time Spiral did, where its flaws are avoided to such a comical extent that nothing that experimented in the same sort of space as Kaladesh would get attempted. Then, Ixalan felt like a step backwards into not just conservatism, but cynical trendspotting and the exploitation of what small children want in market research surveys. It’s difficult to define a design era that we’re living in the middle of, but they key points of the last era are definitely over with. Complexity has come back up in several ways (I was shocked that they let Adapt be usable at instant speed), and Dominaria gets to go “hey, Champions of Kamigawa had some good ideas in it” and still make it to print, where it’s been a huge success. 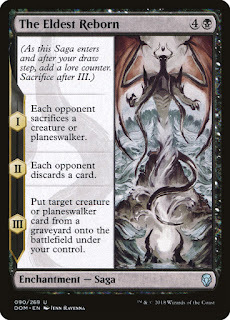 A great document of comparison is Great Designer Search 2 (it’s unfathomably long, so don’t read it yourself, let James and I explain it to you), where the ideas of that bland era of Magic are pushed hard on enterprising designers. Great Designer Search 3 is obviously a lot more open to new ideas, which is a great sign for Magic. Overall, Dominaria is the most inspiring set that’s come from Wizards in many years. It makes me want to draft different strategies I haven’t tried before, it makes me want to build new, terrible decks, and most importantly for me, it makes me think there’s still life and passion in the design of Magic. Because… god, have you tried to write a design review of Ixalan block? How am I supposed to do that without slamming my head into my desk over and over and just wishing that Ixalan was different, interesting in any way? Circling back to how Garfield comes onto the game every few years, there’s something even more important in Dominaria’s role in Magic history. I’ve long held a vague theory that Magic avoids death by, every few years, coming out with something truly brilliant, something that unites both the casual players and the tournament players, something that both hooks newer players into devoting themselves to the game more and reminds more established players why we’ve devoted so much of our lives to the game in the first place. People might either ask whether Magic is dying, or bring up how it’s never actually ended up dying, but I think it’s only because of sets like Alliances, Invasion, Ravnica, Innistrad, and Dominaria that the game has persisted. If you substitute these sets with something mediocre, I don’t think the game would be around any more as we now know it. But I also wonder if Wizards sees unique, innovative sets like Dominaria as something to do once a year (or less), similar to a core set. Their immediate follow-up to Dominaria was two completely fine but utterly by-the-books Ravnica expansions, which I can only read as a massive corporate hedge; a way to tell higher-ups that the year’s slate of expansions isn’t at all risky, when looked at as a whole. Resident Bob Dylan expert checking in. Time out of Mind is the right album to use for your analogy. On the note of Lazy Goblins, are the rest of the series ever coming out, or is my podcast app playing up? I find myself disagreeing with you for a change. Dominaria felt... fine. But then, I quit the game at RtR. Perhaps "fine" by my standards is "shockingly good" by the standards of anyone around for Kaladesh and Ixalan. It's hard not to see it as a Nostalgia Grab though, following up Ixalan's blatant wallet-oriented-design with more of the same, but aimed at the older audience instead. Especially when that's followed up with RtRtR. It doesn't feel to me like a change towards innovation so much as a "bubble & squeak" set. You make it from the leftovers, fry it up, and hey, it's delicious. Just don't think too hard about whether there's anything left in the fridge for tomorrow.